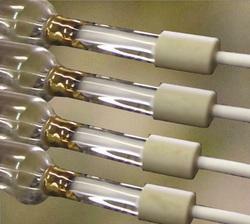 Manufacturer of a wide range of products which include uv curing lamps for uv dryer and uv lamps. We are offering Printing Machines UV Curing Lamps to our clients. We provide high-quality products to our clients. The basis of any UV system for water, air and surface disinfection is a UV source (lamp). UV lamp parameters – power consumption, efficiency, dimensions, lamp life, price – determine technical and economic properties and abilities of the specific UV unit. We are offering UV Lamps to our clients. The basis of any UV system for water, air and surface disinfection is a UV source (lamp). UV lamp parameters – power consumption, efficiency, dimensions, lamp life, price – determine technical and economic properties and abilities of the specific UV unit.